A much simpler explanation for the fear which drives the Trump crowds is a loss of confidence in government assurances that they will keep the public safe. The desire for a moratorium on Muslim immigration may be driven less by a distrust of foreigners than by a deep suspicion of the Obama administration’s screening procedures which have so signally failed. Yet after all these fiascos the administration demands ever-greater powers to spy, not only on the NRA but on Muslims too! Donald Trump is mostly the fault of the political establishment. They have trained people to accept politicians who lie to them, in the hope that on one important policy the politician will at least keep a few of their promises. A person can only be lied to so much before they just stop listening, and there are few topics in politics where we’ve been lied to more than on immigration. The political and intellectual establishment has been doing what they always do when reasonable concerns are raised against their policies: crying that their opponents are mean, or, in this case, racist. When people raised concerns about giving a pass to immigrants who are by definition criminals the establishment called them racist. When people raised concerns about terrorists sneaking through our poorly-designed legal immigration system, the establishment called them racist, and heartless for wanting to break up families. When people raised concerns that letting immigrants bypass the normal immigration process, simply by saying that they’re refugees, might let terrorists in, the establishment called them racist, and heartless for opposing all these children and widows. They were obviously wrong about these things even without the benefit of hindsight. With the benefit of hindsight, we can see the extent of their lies. A broken immigration system may not be the worst source of crime in the United States, but it is one we potentially have a lot of control over. Trump’s call to simply ban all Muslims from entering picked up his polls because it bypasses all of the lies of the political establishment, which, ironically, he is a part of. Make serious efforts to stop illegal immigration. Make serious efforts to remove the benefits of breaking the law to people who break the law. Fix the legal immigration system so that it makes a serious attempt to keep criminals—by United States standards, of course—from moving to the United States. Ultimately, the reformed immigration system should work so well that there is no need to bypass it for refugees. And preface all of this by putting the entire immigration system on hold. Because the problem is that lip service to immigration policy improvements has led people to reasonably fear that any reform will be drawn out and ultimately abandoned, leaving the old, crappy system in place with even more holes in it. The only way to counter Trump’s immigration policy is for the left—and I say this bipartisanly, meaning the left in both parties—to admit that they were wrong and fix the problems they have caused. The people who will elect Trump to the presidency—currently a majority of the voting public shares his views on the fecklessness of the federal government’s immigration system—will not believe you unless you first atone for your past lies. At its most basic, this means changing our immigration policy so that all immigration which is supported is legal, and all immigration that is illegal is opposed either by our police or military powers. I’m not even saying that you have to give up your ideal of an open border. But you can only have this after you prove that you’re serious about immigration security. Immigration policy could very well be a policy as simple as, if you come in through the front door and you pass a simple background check, you can enter the country. But because of your past mistakes (and here I speak of politicians, not immigrants) the security at the border must be serious and effective. Entry to the United States should only be allowed at the front door. Any attempt to enter by the back door is evidence of terrorism or criminal intent and will be stopped, with lethal force if necessary. If you don’t like the idea of lethal force, build the damn wall. The background check system must be completely overhauled so that it is reliable. If someone says publicly that they want to take part in violent jihad, the assumption should be that they want to take part in violent jihad. The entire system of allowing relatives to bypass standard immigration vetting must be ended. Entrants must be judged on an individual basis. And this includes so-called birthright citizenship. If you want open borders and a welfare state, the path to citizenship cannot be that your non-citizen parents managed to come across while they were pregnant. It’s not necessarily a bad policy—I support it—but you, politicians, have abused it so much that you cannot be trusted with it. We can revisit it after you prove you are truly serious about immigration reform and border security. Really, that’s the key. Prove that you are truly serious about immigration reform and border security, and do it now, before the election process begins. 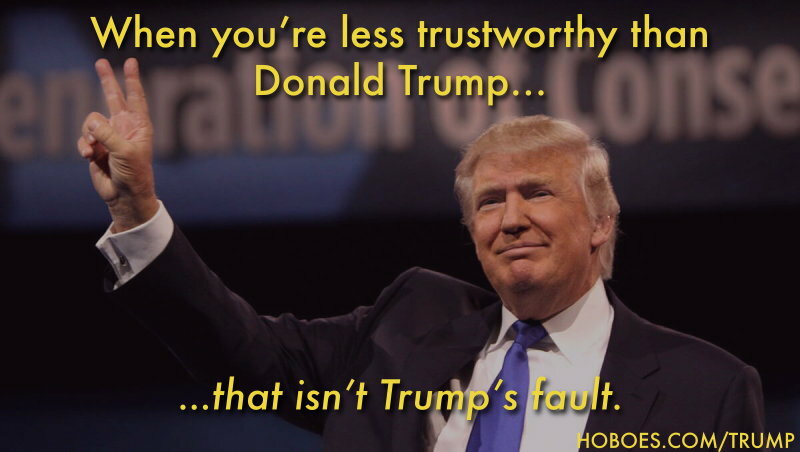 Here’s the thing about Trump’s popularity: nobody trusts Donald Trump. They just trust you less. Honestly, given the way the media play into his hands, I occasionally think they’ll be okay with President Trump. They’re giving him air time that other candidates aren’t getting, and whenever an attack on Trump raises his polls, they keep attacking him in that manner. <- Why should US lead? How to counter Trump’s immigration policy last modified December 13th, 2015.